The 'Charities' page is perhaps the most important on our site, as that's what ride2 Cycling Events are all about. Thanks to the help of our brilliant followers and supporters, we've raised over £41,046 (£45,964 inc Gift Aid!) during our previous events, helping thousands of people across the UK. 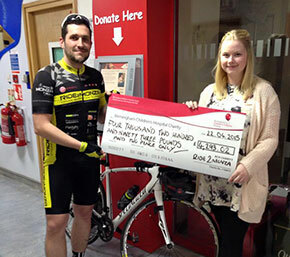 Whether it be providing literature for recently diagnosed patients, specialist equipment for children and adults alike, or simply funding someone to be on the end of a phone providing guidance and support for those who need someone to listen, it really makes the days in the saddle and aching bodies massively worthwhile. Every day, Anthony Nolan match incredible individuals willing to donate their blood stem cells or bone marrow to people with blood cancer and blood disorders who desperately need lifesaving transplants. It all began in 1974. With her three-year-old son Anthony in urgent need of a bone marrow transplant, Shirley Nolan set up the world's first register to match donors with people in desperate need. Now, we help three people each day find that lifesaving match. We also conduct world-class research into stem cell matching and transplants, so we can make sure every person in need gets the best possible treatment. Birmingham Children's Hospital charity exists to make things better for the hundreds of children, their families and the staff who are treated there each year. They provide funding for important equipment, pioneering research and all the important extras that make their hospital so special, and provide funds for those projects and services which fall outside the remit of the NHS. Cancer is the name given to a range of specific illnesses resulting from one of our body's own cells growing out of control. There are more than 200 different types of cancer, each with different causes and symptoms requiring different treatments. Cancer Research UK has been working on pioneering life-saving research for over a century and made real progress in preventing, diagnosing and treating cancer. They fund scientists, doctors and nurses to help beat cancer sooner and provide cancer information to the public. Every step they make towards beating cancer relies on every pound donated and a number of bodies work together to ensure that they make the best use of the funds we receive and continue to carry out world-class research. MIND provides advice and support to empower anyone experiencing a mental health problem. They campaign to improve services, raise awareness and promote understanding and won't give up until everyone experiencing a mental health problem gets support and respect. After many years of campaigning, in 2013 the Mental Health (Discrimination) Act removed the last significant forms of discrimination from law. It repeals legislation that prevented people with mental health problems from serving on a jury, being a Director of a company or serving as an MP. The MS Trust is dedicated to making life better for people living with Multiple Sclerosis by providing free information to everyone affected by MS and by supporting the health professionals who work with MS, and also fund ground-breaking stem cell research at Bristol Hospital. So far the medication is working well, and inbetween relapses he's sucessfully completed London to Paris 2008, ride2spa 2012 and ride2monza 2014, with ride2monaco 2016 being his 4th cycling challenge in 8 years. Virgin Money Giving is a not-for-profit organisation. Fundraisers and donors can be 100% confident that the company they’re dealing with isn’t making a profit on their donation and that more of their hard-earned cash is going to the causes they’re passionate about. and add your chosen Charity to this page!